(Bridgewater, N.J., July 26, 2018) - The Somerset Patriots welcomed their 7,000,000th Fan to TD Bank Ballpark on Thursday, July 26th. 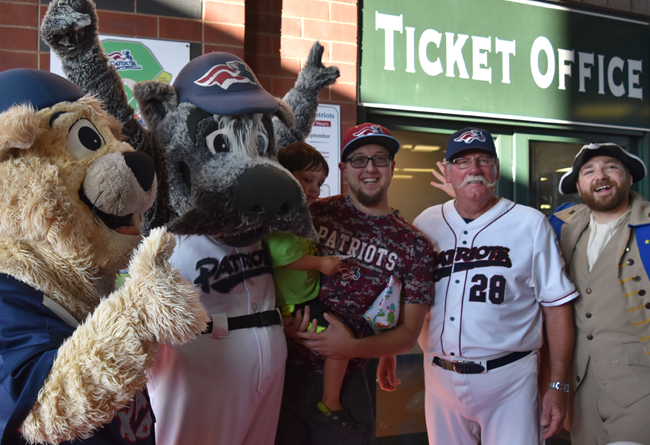 At 6:34 pm, Dan Heitkamp of Washington Township purchased the ticket to the game and entered the main gate with his 4-year old godson Logan where he was greeted by Somerset Patriots President/General Manager Patrick McVerry and Manager Emeritus Sparky Lyle among the fanfare. As the balloons fell over the main gate, Heitkamp was ushered down to the field to be introduced to the crowd and receive gifts from team’s partners, 2019 season tickets, a team-signed bat, and a jersey with the words “7,000,000th Fan 18” on the back. After receiving his 7,000,000th Fan items, Heitkamp took the mound to throw out a ceremonial first pitch and was greeted by mascots from throughout the area in attendance for Sparkee The Mascot’s birthday celebration. “I had the week off so I’ve been bringing people to games all home stand. Logan wanted to see all the mascots here for Sparkee’s birthday so that’s why we came tonight,” Heitkamp said. Originally from Flemington, Heitkamp has been coming to multiple Somerset Patriots games a year since 2001. He is not only a fan of the baseball, but also the overall experience at the ballpark. The award-winning TD Bank Ballpark officially opened up for business on June 7, 1999 and has become the premier community-gathering place in Central New Jersey. The 7,000,000th fan was reached on Somerset’s 1,333rd opening in franchise history, good for an average attendance of 5,251 fans per game over a 20-year period. The team was one of the fastest franchises to reach each of the 1,000,000-fan marks already achieved. The 6,000,000th fan was surpassed in mid-August of 2015.